I’m inviting you to Boston MA 1891. In that year Edward and Lincoln Filene took over the management of their father’s retail store called Filenes. At the time it was quite a successful business that specialized in women’s fashions and accessories but the two brothers built it into one of the world’s leading retail companies by implementing a non-traditional business model. The lead player in the strategy development was Edward (known as E.A.) He had a very strong social conscience and implemented a number of employee welfare initiatives that were way ahead of their time but that is not want I want to talk about. What I do want to talk about is the intersection of working capital management and business models. Edward believed that science would solve “mankind’s dilemmas”, which in the context of a retail store he considered stock markdowns to be such a dilemma for which there should be a scientific solution. He saw stock that customers did not want just sit on shelves and racks, take up space, consume resources and eventually be sold at a loss on the original cost not to mention the holding cost. He noted that most retailers at the time were unwilling to admit they made a buying error and offered any number of reasons for the products not selling and why they should hold onto them. It seemed to him that if you’re going to take a loss you may as well take it quickly and free up resources to place bets on other products your customer might want to buy. To deal with this challenge Edward came up with an idea he called an Automatic Markdown System. Note the word “system” meaning it automatically came into play when certain events triggered it thereby removing from the markdown process any decision-making input. Essentially he applied the mechanics of a Dutch Auction system that made his business known as Filene’s Automatic Bargain Basement phenomenally successful and his family phenomenally wealthy. An item is placed in the main store at its intended full retail price. If the item is unsold 12 selling days later it is moved to the basement of the store building. The original price tag remains on the item together with the date on which it first went on sale. The price of the item is now marked down by 25%. If the item remains unsold after 6 further selling days (i.e. now it’s been available for 18 selling days) it’s marked down 50% (from the original price). Finally, if it is still unsold after a further 6 selling days it’s donated to charity. That is, written off to a good cause. Apparently, 90% of the stock is sold within 12 days and only one tenth of one percent goes to charity. It took 10 years for the business model to become profitable but it eventually accounted for 25% of the store’s sales and during the 1930’s depression its profit compensated for the store’s other losses. Now, if you’re familiar with my thoughts on discounting you’re probably wondering why I’m discussing a discounting success story. I categorically do not advocate using discounting randomly to generate sales in knee jerk manner and I talk about it often to anyone willing to listen. We have created margin tables that show very clearly the folly in doing this. For example if you’re operating on a GP of 30%, a 10% drop in price requires a 50% increase in sales volume for you to just maintain your absolute gross profit. Anything less than 50% will erode profit. In other words, this is not a strategy for improving profitability. However, that is not the strategic initiative Edward had in mind. The subtlety of his idea needs to be taken notice of. His was a business model innovation and the automatic markdown system was an essential component of his marketing and pricing strategy. The success of modern day big box retailers reflects the efficacy of low-cost pricing but it must also be complemented by low cost supply chain logistics and distribution. Knee jerk discounting does not fit here. By placing the marked down products in the basement of his store he employed brilliant strategic positioning. Think about the connection between low price and a windowless basement. Concrete floors and bland clothes racks. All sales were for cash – no charge accounts. Filenes also employed only a few sales assistants in the basement to keep costs low and they were there to restock and collect money not to help buyers choose – self service 1901-style. And here’s an interesting twist to the story. The motive for introducing this pricing strategy was to quickly get rid of stock that was not selling as soon as possible. That freed up cash to replace it with stock that would sell or could at the least be turned over rapidly. In either case there would be an equivalent ROI (the “I” being the cost of the stock.) In other words Edward intuitively knew that to maximize business value growth you need to maximize the ROI of all its resources. For example, suppose you have a stock item that yields a gross margin of 40% at normal prices and you have a stock turn of say 60 days – 6.08 times per year. Every $1 invested in that item would yield an annual return of $2.43 (6.08 x $0.40 per turn) i.e. a ROI of 243% – not too shabby. 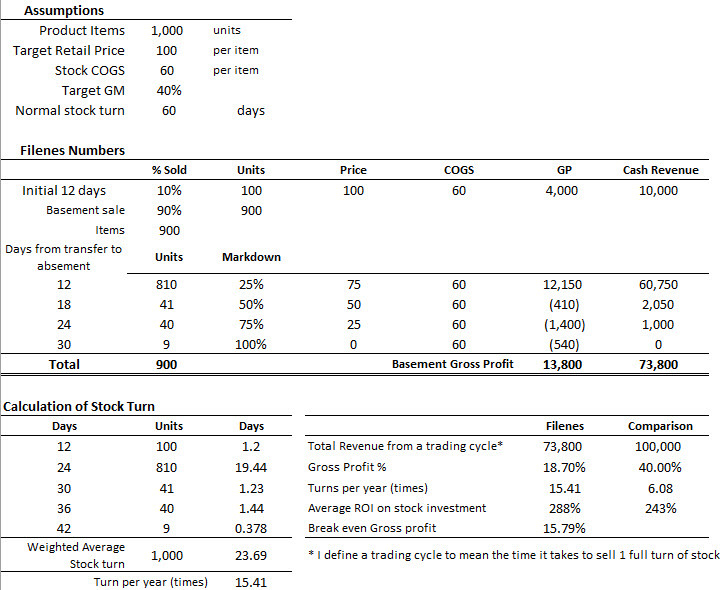 But if your stock turn is say 15.41 times per year (see the table below which makes some assumptions about what Filenes might look like) your gross margin could be as low as 15.79% and still give you a ROI of 243% However, other things being equal and based on my assumptions, the Filenes model yields an inventory ROI of 288% which is significantly higher than the comparison company. The above table makes several assumptions relating to the Filenes business model (these are my guesses based on the information I have available.) At first glance you might think there’s not much difference between a ROI of 288% and 243% but there is. The compounding effect over a 10 year period is a factor of 5.4 times. To put that another way, over 10 years the Filenes model would yield 5.4 times more gross profit for each $1 of inventory compared with the comparison company. I should also mention that a little-known module in GamePlan addresses this very issue – it’s called Sales Analysis and it’s on the Planning & Analysis/GamePlan Tools Menu. Edward discovered that the automatic markdown system was LOVED by customers and it became an essential component of the company’s marketing strategy. In fact, he quickly realized that there was serious profit to be made from selling quality merchandise at low prices which meant he had to buy it cheaply and this led to his buyers scouring the world for surplus unwanted quality branded stock, seconds, stick from closeouts, imperfect or slightly damaged merchandise, and buying unsold stock from upmarket retailers like Saxs Fifth Avenue and Neiman-Marcus. This business model is now used by Ross Dress for Less and TJ Max in the US and others around the world. What this illustrates is how strategy often (more often than not actually) emerges from experience and observation rather than from someone sitting down and dreaming up a business model. But the key to this is to always be taking time out to notice what’s going on and then reacting quickly. For generations of New England shoppers …. shopping at Filene’s basement has also provided a blood sport. Every morning at the opening gong at 9:30, there is a crushing stampede of customers who have been waiting at the entrances. They burst into the hot, smelly, narrow aisles, snatching from gas-pipe racks and intentionally shabby wooden counters as they run. Individual fights between customers, clawing, biting, and cursing over the same article are everyday affairs and near-riots are not uncommon. For those who enjoy spectator sports … there is an endless show. Most women refuse the inevitable wait for fitting rooms, preferring to strip in the aisles to try on their treasures. And while the customer is pulling a new dress over her head, she risks losing not only the others she has torn from the racks and must put down for an instant but also her own. If you have any doubt about the accuracy of this statement, which I’ve taken from Leon Harris’ fascinating book Merchant Princes (1979) page 16, take a look at the video below that shopping frenzy associated with another of Filene’s innovations The Annual Running of the Brides. The key to business success is not pursuing this tactic or that. It’s about having a business model that works in the sense that all the pieces fit together to provide a customer experience that enough customers want. Business success is often an iterative process that comes from trying out ideas and seeing how customers respond. If they work refine then and develop them further. If they don’t, try something different. Understanding the numbers and not slavishly following some dogma that you learnt at college is important. There are always several ways to look at things but when it comes to strategic thinking the over-reaching rule is that all the pieces have to fit together and at the end of the day the number will tell you if you were right. Finally, there’s been an understanding of sound financial management principles for a long time and if you take some time out to read biographical studies of great entrepreneurs and business leaders it’s amazing what you’ll learn and can share with your clients.